Founded in 1970, Chicano Park in Barrio Logan has a long and important history of community empowerment and celebrating the region’s indigenous and Mexican-American cultures. Looking ahead to this landmark’s 50th anniversary, a calendar commemorating the national historic site’s legacy has been released in order to raise funds for the silver anniversary celebrations, scheduled for April of 2020. The calendar was produced through a collaboration by the Chicano Park Steering Committee and lowrider group Amigos Car Club, with muralist Salvador Barajas and activist Rigo Reyes directing the project. Throughout it’s 17-month length, ranging from January 2019 to May 2020, the calendar displays lowriders next to the park’s murals, honors the names of park founders who have passed away and marks important dates related to Chicano and Latin American history. For Reyes, the calendar and its educational focus represents an opportunity to tell people about the park’s story and its foundation in the Chicano movement. “Today, more than ever, it is very important to educate those interested in the park with our voices now that it is a National Historic Landmark because the status has brought in many outsiders and we don’t know what history or education they are being given. It is important that they are told the real history of what happened in the park,” he explained. This collaboration is not the first time the steering committee has joined forces with Amigos Car Club. The club organizes the car exhibition at the yearly Chicano Park Day celebration, and many of its founders have also served on the steering committee, in addition to other community groups. This is also not the first time a calendar has been produced ahead of a major anniversary celebration. In 1990, Barajas also created a calendar to raise funds for the park’s 30th anniversary celebration. 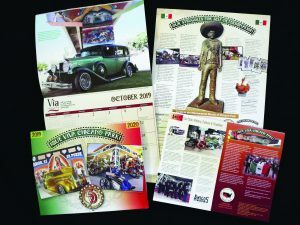 The calendar is currently available through steering committee members, members of Amigos Car Club, and at the offices of Via International (1955 Julian Avenue, San Diego).